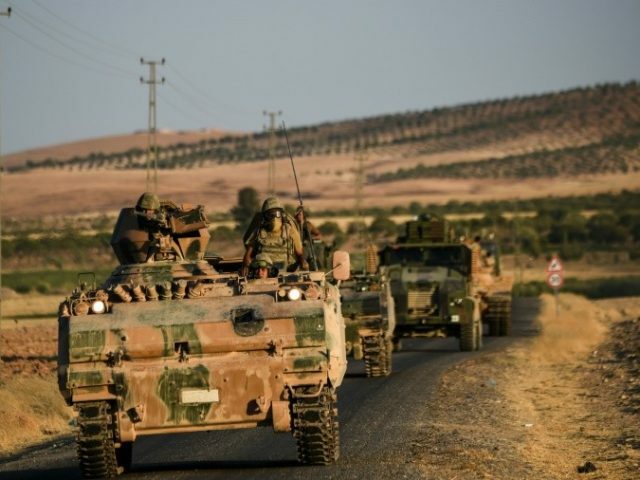 A large number of Turkish tanks crossed the border into Syria, and many more are massed on the border, ready to cross, in what Turkey is calling a “new phase” of its military action in Syria. 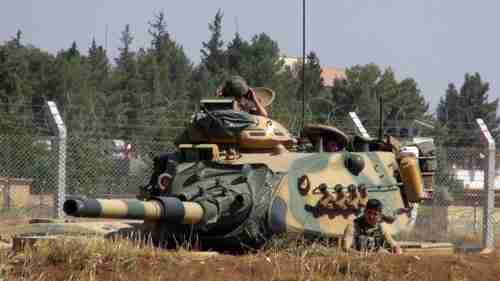 Turkey’s tanks are supported by thousands of Free Syrian Army (FSA) rebels who have been fighting both the so-called Islamic State (IS or ISIS or ISIL or Daesh) and the Kurdish People’s Protection Units (YPG). Both the FSA and the YPG are backed by the US military, even though they are fighting each other. The US administration favors the YPG because it has been the major fighting force against ISIS, which the US considers a threat to its national security. The Syrian Kurds have been the most effective US ally in fighting ISIS in Syria, but they have had another major objective — namely to take control of a region along almost the entire Syria-Turkey border, in order to declare an independent Kurdish state called Rojava. This plan is anathema to both Turkey and Syria. Although Turkey’s tanks are nominally fighting ISIS, there’s little doubt that the principal target is the YPG. From Tuesday to Friday of the last week, Syria’s anti-regime rebels conducted the biggest coordinated rebel assault in Hama province since 2014, and seized control at least 14 villages. The rebels came under heavy air attacks by the air force of Syria’s president Bashar al-Assad, as well as by Russian warplanes. Hama province is of strategic importance, because it connects rebel-controlled Idlib province to Damascus. But it also carries a great deal of symbolic importance. Hama was the site of some of the first anti-Assad protests at the beginning of the “Arab Spring” in 2011. At that time, al-Assad responded to the peaceful protests by shelling civilian neighborhoods and shooting protestors on sight. But it was also the site of the bloodiest massacre by al-Assad’s father Hafez al-Assad in the Syrian civil war. Syria’s last generational crisis war was the civil war that climaxed in 1982 with the massacre at Hama. There was a massive uprising of the 400,000 mostly Sunni citizens of Hama against Syria’s president Hafez al-Assad, the current president’s father. In February, 1982, al-Assad turned the town to rubble, 40,000 deaths and 100,000 expelled. Hama stands as a defining moment in the Middle East. It is regarded as perhaps the single deadliest act by any Arab government against its own people in the modern Middle East. But once the Hama was destroyed, the anti-government movement against Hafaz al-Assad pretty much ended, as that was the climax of the generational crisis civil war. But today’s war is not a generational crisis war, but an Awakening era war, and the rules are different. Today’s anti-Assad rebels still have fresh memories, either personally or through their parents, of the 1982 massacre, and they’re not going to allow anything like that to stop them this time. Al-Assad was saved by the massive intervention by Russia, Iran and Hezbollah. However, al-Assad’s government is rotten to the core, and the Russian military intervention appears to have save al-Assad only temporarily, as the army is once again showing signs of collapse. What we’ve seen in the past week does raise the prospect he may lose Hama city, which is the 4th largest city in Syria. The majority of the local population is against the regime there, and it’s really in effect been an occupying force in Hama since early in the uprising. [The regime is] trying to get back into this artillery base in Aleppo, and they’re putting up wave after wave of attacks to be able to do this, and they may be able to claim this one victory, but the problem is that they’ve got to this on multiple fronts now. They not only have to be able to secure areas on the Aleppo front, they’ve got to be able to push the rebels back on the Hama front. We knew this a year ago. At the time when the rebels took the entire Idlib province up in the northwest, we knew that there were manpower problems, because president Assad came out and said it. He sort of warned his population almost in a sense that the military was on the point of collapse. We’re now looking at a de facto partitioning of the country. You’re going to have Kurdish areas of Syria up in the northeast, because the Kurds have pushed back the Islamic State. The rebels who now of course have Turkish support will hold parts of the north and the northwest. The Assad regime, which can no longer hold a national government, will try to hold the line from the Mediterranean through Homs to Damascus, and president Assad will hope to continue to remain in power as president of not all of Syria but at least part of it.